May 2018 24 www.sportseventsmagazine.com t SPECIAL Feature Lyman, Waterboro, Hollis and Old Orchard Beach. 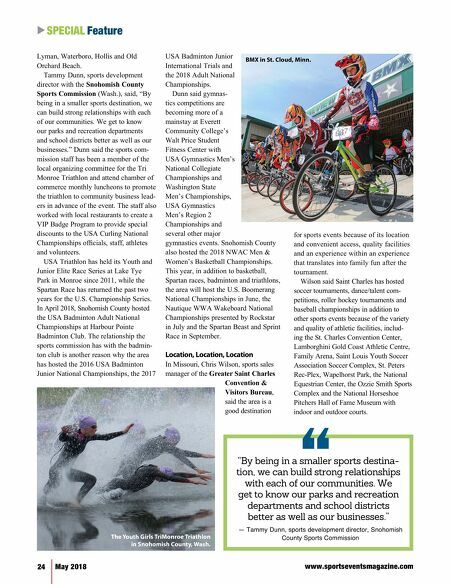 Tammy Dunn, sports development director with the Snohomish County Sports Commission (Wash.), said, "By being in a smaller sports destination, we can build strong relationships with each of our communities. We get to know our parks and recreation departments and school districts better as well as our businesses." Dunn said the sports com- mission staff has been a member of the local organizing committee for the Tri Monroe Triathlon and attend chamber of commerce monthly luncheons to promote the triathlon to community business lead- ers in advance of the event. The staff also worked with local restaurants to create a VIP Badge Program to provide special discounts to the USA Curling National Championships officials, staff, athletes and volunteers. USA Triathlon has held its Youth and Junior Elite Race Series at Lake Tye Park in Monroe since 2011, while the Spartan Race has returned the past two years for the U.S. Championship Series. In April 2018, Snohomish County hosted the USA Badminton Adult National Championships at Harbour Pointe Badminton Club. The relationship the sports commission has with the badmin- ton club is another reason why the area has hosted the 2016 USA Badminton Junior National Championships, the 2017 USA Badminton Junior International Trials and the 2018 Adult National Championships. Dunn said gymnas- tics competitions are becoming more of a mainstay at Everett Community College's Walt Price Student Fitness Center with USA Gymnastics Men's National Collegiate Championships and Washington State Men's Championships, USA Gymnastics Men's Region 2 Championships and several other major gymnastics events. Snohomish County also hosted the 2018 NWAC Men & Women's Basketball Championships. This year, in addition to basketball, Spartan races, badminton and triathlons, the area will host the U.S. Boomerang National Championships in June, the Nautique WWA Wakeboard National Championships presented by Rockstar in July and the Spartan Beast and Sprint Race in September. Location, Location, Location In Missouri, Chris Wilson, sports sales manager of the Greater Saint Charles Convention & Visitors Bureau, said the area is a good destination for sports events because of its location and convenient access, quality facilities and an experience within an experience that translates into family fun after the tournament. Wilson said Saint Charles has hosted soccer tournaments, dance/talent com- petitions, roller hockey tournaments and baseball championships in addition to other sports events because of the variety and quality of athletic facilities, includ- ing the St. Charles Convention Center, Lamborghini Gold Coast Athletic Centre, Family Arena, Saint Louis Youth Soccer Association Soccer Complex, St. Peters Rec-Plex, Wapelhorst Park, the National Equestrian Center, the Ozzie Smith Sports Complex and the National Horseshoe Pitchers Hall of Fame Museum with indoor and outdoor courts. BMX in St. 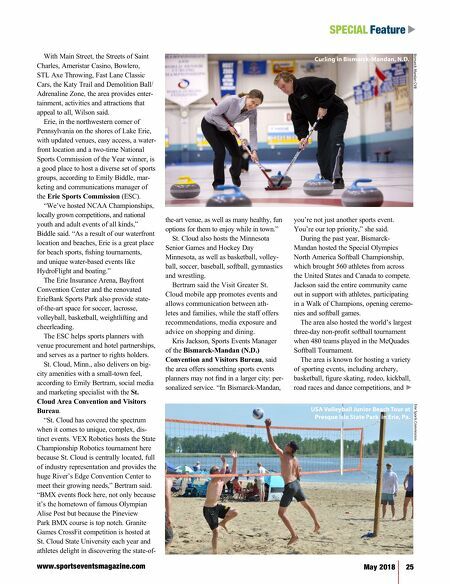 Cloud, Minn. "By being in a smaller sports destina- tion, we can build strong relationships with each of our communities. We get to know our parks and recreation departments and school districts better as well as our businesses." '' — Tammy Dunn, sports development director, Snohomish County Sports Commission The Youth Girls TriMonroe Triathlon in Snohomish County, Wash.